The Nuclear Magnetic Resonance (NMR) Facility at UC Davis is a Core Science Facility operating under the Office of Research. We provide qualified researchers in the biological, medical, and physical sciences access to state-of-the-art NMR instrumentation for spectroscopy and imaging. The Facility presently operates nine spectrometers of varying purposes and capabilities, four of which are operated jointly with the Chemistry Department and located in the Chemistry building. 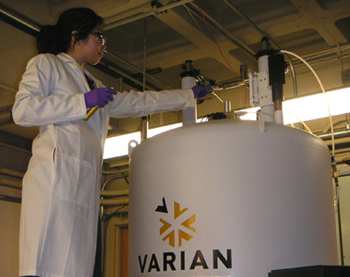 One Avance 500 spectrometer, located in Kemper Hall, is devoted to solid state NMR spectroscopy. Four additional instruments are located at the MedSci NMR facility (MS1-D), about a five minute bike ride from the Chemistry building. All of the spectrometers are multinuclear and a large variety of liquids, solids, surface, and imaging probes are available for use. The Facility provides an annual training class (offered every Fall quarter as BCM 230) to the campus to enable users with long term research projects to independently operate the spectrometers. CHE 219 and 219L are offered as a Graduate level course for Spectroscopy of Organic compounds and also provide training on the Chemistry instruments. Individual training, safety (required, see below) and operational (if needed) can also be requested at the time a PPMS account is requested. Further information on training and the Facility, including spectrometer scheduling procedures, are available from the Facility office. Please contact Jeff Walton - jhwalton@ucdavis.edu for more information. 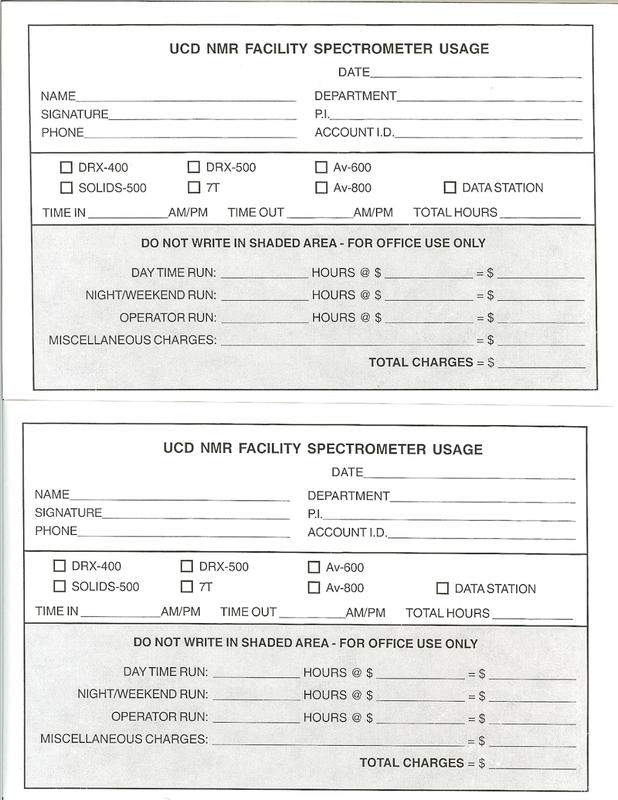 To reserve instrument time on any of our spectrometers, you can access the online Scheduler Here. For more details, please visit our FAQ page. A PPMS account is required to access to the scheduler. Click on the request account link on the front page of the scheduler. After using any of our Bruker instruments located at MedSci 1D, you must complete the billing sheet found in binders near the spectrometer. If billing form is missing, please print out a new copy.